KATHLEEN A. BIRMINGHAM vs. HELMUT G. COLBATH, JEANNE D. COLBATH, PAUL R. MORONEY and JANET ALLEN MORONEY. The plaintiff, Kathleen A. Birmingham, of Boston in the County of Suffolk, registered owner named in, and present holder of, Certificate of Title No. 41346 issued by the Suffolk County Registry District of the Land Court (Exhibit No. 4), filed a complaint in this Court on February 29, 1980 for a declaratory judgment that an easement to which the plaintiff's land admittedly is subject was limited to the right to pass and repass on foot and by fuel vehicles only throughout a passageway shown on Land Court Subdivision Plan 5996-C (Exhibit No. 1). The defendants named in said complaint were Helmut G. Colbath and Jeanne D. Colbath, the then owners of the dominant tenement shown as Lot C on said plan, a copy of which is attached hereto as Appendix A. Subsequently the Colbaths conveyed Lot C to Paul R. Moroney and Janet Allen Moroney, the registered owners named in and present holders of Certificate of Title No. 92573 issued by said Registry District and dated March 18, 1980 (Exhibit No. 7). A motion by the plaintiff to add the new owners as parties was allowed by the Court on July 23, 1980, a motion to amend the complaint by filing a Substituted Complaint having been allowed on the preceding July 8. The "Defendants' Answer to Plaintiff's Substitute Complaint and Counterclaim" alleges that the plaintiff's locus is subject to any reasonable use of the passageway as a "passageway," and that the action is barred by laches and the Statute of Frauds and seeks a determination that the easement appurtenant to said Lot C includes not only the rights alleged by the plaintiff but also the right to operate motor vehicles upon and over said passageway. A trial was held at the Land Court on September 16, 1980 at which a stenographer was appointed to record the testimony. All exhibits introduced into evidence are incorporated herein for the purpose of any appeal. After the conclusion of the trial a view was taken by the Court in the presence of counsel. 1. Granville B. Fuller, Ralph W. Short and George S. Fuller, Trustees, formerly owned Lots A and B shown on Land Court Subdivision Plan No. 5996-B (Exhibit No. 6) and covered by Certificate of Title No. 40470 (Exhibit No. 5). Said lot is subject to rights of passageway over a passageway ten feet wide on the Southwesterly side of said parcel as shown on said plan for the benefit of the owners and occupants of Lot A as shown on said plan. 3. The reverse side of said deed bears a legend by the then Engineer for the Court establishing that Lot A referred to in said subject right is in fact Lot C as shown on Land Court Subdivision Plan No. 5996-C.
4. 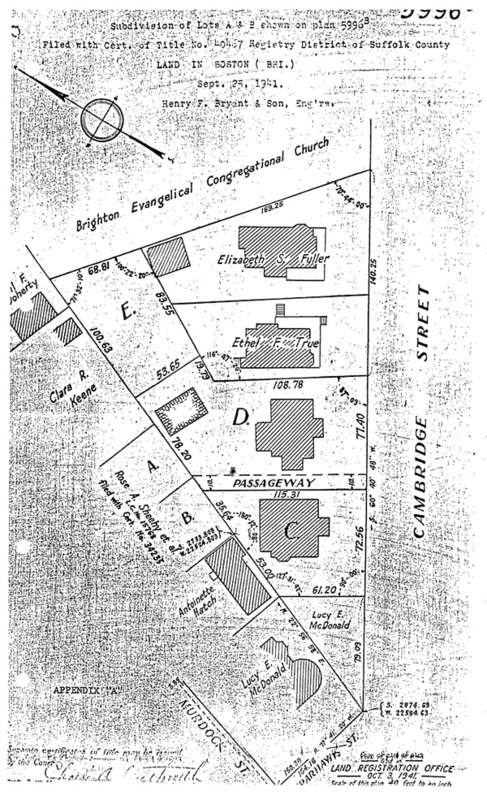 As is apparent from Appendix A the passageway is ten feet in width, is situated entirely on Lot D, extends from Cambridge Street to the northwesterly boundary of Lot D, and adjoins the boundary line between it and Lot C.
The above described land is subject to passageway rights as set forth in deed from Granville B. Fuller et al Trustees to Kathleen A. Birmingham, dated November 19, 1941, filed and registered as Document No. 154690. Said premises are hereby conveyed with the benefit and the right to pass and repass on foot over a driveway ten feet wide as shown on said plan. Said foot passage may be used also by vehicles to supply fuel for the residence on the above described premises (sic) including hereby all rights reserved to myself in my deed to Kathleen A. Birmingham dated Nov. 14, 1941 registered as Document #154690. The words comprising said appurtenant right were typewritten through "above described premises," and the concluding phrase was added in handwriting. The above described land has the benefit of passageway rights as set forth in a deed from Granville B. Fuller et al Trustees to Kathleen A. Birmingham dated November 19, 1941, filed and registered as Document No. 154690, and as set forth in a deed from said Trustees to Katherine E. Holland dated January 12, 1942, filed and registered as Document No. 155351. 8. At the time the plaintiff purchased her home, the rear yard behind the house on Lot C was grassy with a clothes yard therein. Subsequently Miss Holland had the yard paved and used the passageway for access to and egress from it with her motor vehicle, allegedly with the plaintiff's permission. 9. The homes of the parties are situated on Cambridge Street, a busy thoroughfare in the Allston-Brighton District of said Boston. They are situated across the street from a public school and in the immediate vicinity of St. Elizabeth's Hospital. Parking is permitted on the street which makes it difficult for abutters to secure a parking place near their homes. The terrain is such that there is a retaining wall approximately four feet in height where Lot C fronts on the sidewalk, and this is characteristic of other properties in the neighborhood. 10. There is a concrete sidewalk on Lot C leading to the rear of the premises, and two intake facilities for fuel oil hoses. The sole contention between the parties is whether the defendants' appurtenant right is broad enough to include the right to use the passageway for motor vehicles or whether it is limited to foot passage and fuel vehicles. The common grantors reserved passageway rights in the passageway shown on Appendix A and located on the plaintiff's land for the benefit of the adjoining premises. There is nothing in the language used in creating the reservation which indicates the kind of travel for which it is to be used. A passageway may be used only for pedestrians, Perry v. Snow, 165 Mass. 23 (1895), or for motor vehicles as well. Tehan v. Security National Bank, 340 Mass. 176 , 181-82. The language creating the easemnt should be construed in the light of the attending circumstances which tend to show the intent of the parties. Doody v. Spurr, 315 Mass. 129 , 133 (1943). It is well settled, however, that an easement granted in general terms is not necessarily limited to the uses made of the dominant estate at the time of its creation but is available for all reasonable uses of said estate. Marden v. Mallard Decoy Club, 361 Mass. 105 (1972). There is nothing in the circumstances surrounding the creation of the reservation in 1941 which impels the conclusion that it was to be limited to foot travel and fuel oil vehicles, a peculiar combination in the light of the language used by the draftsman and now construed by the Court (i.e. "rights of passageway over a passageway ten feet wide"). The passageway ran the entire length of the common boundary, and was of sufficient width for a car to pass. The terrain of the dominant estate is such that the construction of another driveway would be more expensive than normally is the case. The back door of the house on the defendants' lot is closer to the plaintiff's driveway than it would be to one constructed on the other side of the defendants' house, and there already was a walkway on the defendants' Lot C adjacent to the common boundary line. The rule of ejusdem generis might well dictate that if trucks were to use the driveway, which the plaintiff admits, cars by the very nature of things should be included as well. In cases where the court has limited the use of a passageway to foot traffic there were physical reasons for doing so. In Perry v. Snow, supra, the passageway was too narrow for wagons and trams to pass, and they never had done so. In Rowell v. Dogget, 143 Mass. 483 (1887), the grant provided that the "fruit trees now in a bearing state" were not to be injured, a result which, because of their placement, could not have been avoided if use of the way was to be construed as more comprehensive than use on foot and in Doody v. Spurr, supra, the walk physically was found of insufficient strength to withstand use by a car. On the other hand the Supreme Judicial Court broadly construed a grant in Marden, supra, which a Land Court judge had ruled was limited to foot passage. It is true that in the present case the common grantors originally reserved unlimited passageway rights, and that thereafter they apparently initially intended to limit the rights previously reserved when they conveyed said Lot C. Doubtless if they so chose, they could indeed do so. However, there was added in handwriting in ink after the language set forth in paragraph 6 above relative to foot and fuel a phrase which makes it apparent that the grantee insisted that the conveyance to her include all the passageway rights reserved some months before in the conveyance to the plaintiff. To one familiar with the closing of real estate transactions it seems plain that this is the explanation for the addition to which my attention has been directed. This reasoning makes inapplicable here the usual rule of ejusdem generis that general language which follows specific words embraces only similar objects. Dickson v. Riverside Iron Works, Inc. Mass. App. Ct. (1978). [Note 1] In any event it certainly is arguable that a fuel truck is in a class which embraces lesser motor vehicles such as a passenger car. On all the evidence I find and rule that there is appurtenant to the premises described in Certificate of Title No. 92573, being Lot C on Land Court Subdivision Plan No. 5996-C, the right to pass and repass, both on foot and in vehicles, throughout a passageway ten feet in width shown on said plan for access to, and egress from, Lot C and Cambridge Street and the right also for said passageway to be used by vehicles to supply fuel for the residence on Lot c. The defendants do not claim a right to park in said passageway, and the Court finds and rules that no such right exists. [Note 1] Mass. App. Ct. Adv. Sh. (1978) 114, 117.